In mid-January Barbara and I went to Miami to search for a La Sagra’s Flycatcher, a Western Spindalis and a Banaquit, which were being seen on Virginia Key or on Key Biscayne as reported on the North American Rare Bird Alert. 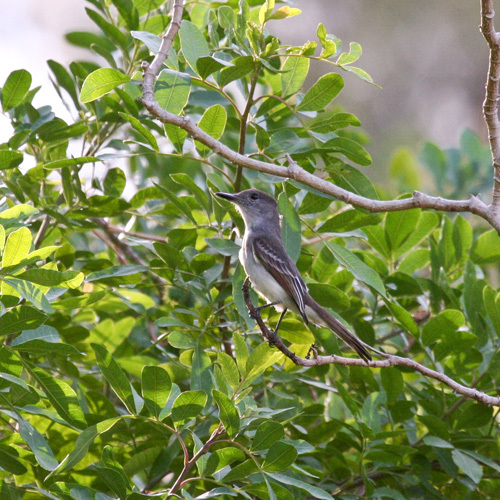 We found the La Sagra’s Flycatcher (my North American #712) without too much difficulty, along a stretch of road near the Sewage Treatment plant on Virginia Key. A couple of days of searching failed to turn up the Western Spindalis or the Banaquit, although the former is still being seen on Virginia Key and the latter on Key Biscayne. We were among a significant group of birders who struck out during the days we were looking for these two rarities. But the trip was not nearly the failure that a one-for-three result might imply. 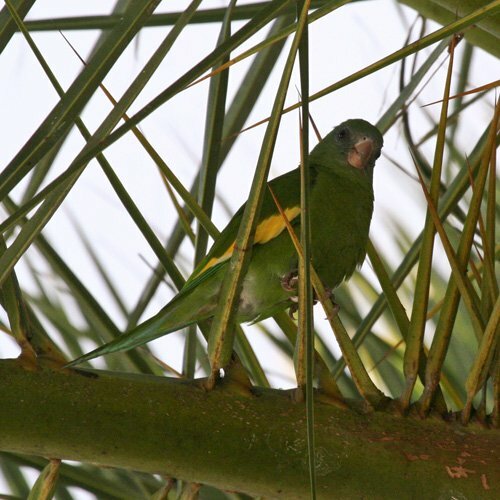 On several prior visits to Miami, I have looked for White-winged Parakeets, but never found them. On this trip, while again searching for White-winged Parakeets in north Miami, I spied two likely suspects perched in dead tree. At the time I thought they were Yellow-chevroned Parakeets, but after viewing Barbara’s photos, I am not sure of that. Maybe they are White-winged Parakeets. I welcome any input from birders more familiar with the subtle distinctions between the two species who may chance to read this blog. Unfortunately, they did not fly so I never saw white (or lack thereof) on the wings. 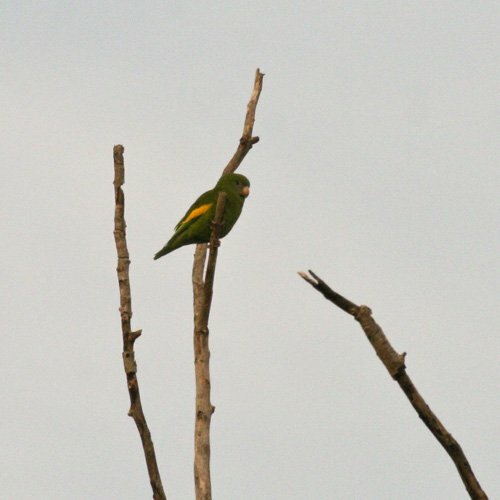 Formerly conspecific with the White-winged Parakeet and together known as the Canary-winged Parakeet, the Yellow-chevroned Parakeet and the White-winged Parakeet were split into two separate species by the bird scientists a few years ago. The Yellow-chevroned Parakeets have not been recognized as “countable” by the American Birding Association (although they are now in fact more numerous than the White-wings). Believing that I had not yet seen any White-winged Parakeets, on the afternoon before our return, following some tips from birders we met on the Keys, we drove to a car lot on a busy and noisy LeJeune Avenue, just south of the Miami Airport. The traffic was unbelievably loud, and was enhanced by very loud music broadcast at the car lot. The young men who worked at the car lot, however, knew just what we were looking for and helpfully pointed out the very tree where parakeets most often could be seen. They told us that the birds often flew back and forth between the car lot and Ocean Bank across LeJeune Avenue, where there were several large palm trees. We stuck it out at the car lot until dark, with no results. The next morning, however, we returned for a last ditch effort before going to the airport, and within minutes, several White-winged Parakeets (my North American list # 713) attracted us to the designated tree, where we were able to observe them briefly, before they flew across the street to the palm trees at the Ocean Bank “outdoor atrium”. 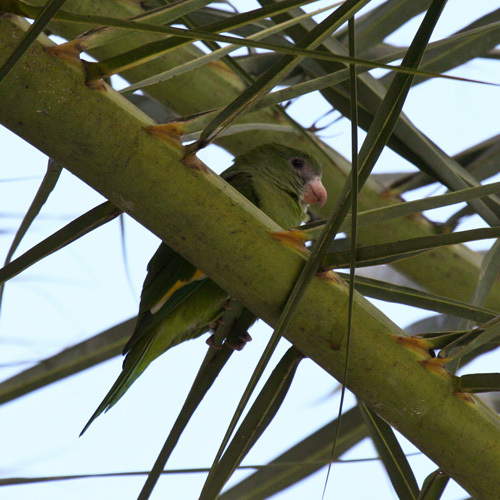 We followed them, and Barbara was able to photograph them as they preened among the palm fronds. The highlight of this trip, however, was not the birds, but the opportunity to join some first cousins once-removed, most of whom we had never met, at a family gathering and excellent dinner at one’s home in Coconut Grove. We had a great time with them. 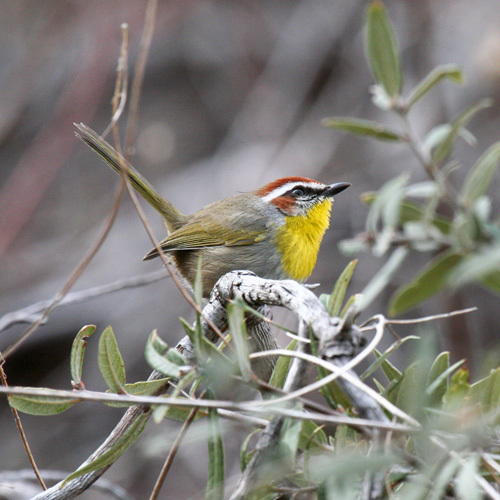 We made a quick trip to Arizona on January 6th to look for two potential Life Birds: Rufous-capped Warbler (an ABA Code 3) and Nutting’s Flycatcher (an ABA Code 5). Both were being seen regularly at specific, but widely separated, locations. We stayed in Green Valley the evening of our arrival and drove up to Florida (pronounced “Floreeda”) Canyon early the next morning. We hiked up and down Florida Canyon several times looking for the Rufous-capped Warblers. Several other birders were doing the same thing. We arrived about 8:30 a.m. and at about 2:30 p.m. after a picnic lunch and a short rest at the dam, we decided to take one last hike back up the canyon. All but one of the pairs of searchers that we had encountered during the day had departed. As we neared the end of our last upward climb, Laurens and Louise Halsey motioned us to proceed forward quickly, as they had just seen the Bird. After a brief search, it was relocated and we saw it close and well and for quite some time. We thank Laurens and Louise who were very helpful to us in relocating this lovely little life bird. Laurens is a professional Birding and Nature Guide and he can be contacted at www.desertharrier.com, desert-harrier@cox.net or 520-237-1284. The Rufous-capped Warbler became number 709 on my North American Life List, and number 52 of my favorite family, the Parulidae, or Wood Warblers. That leaves me yet to find a Crescent-chested Warbler (ABA Code 5), and a Fan-tailed Warbler (ABA Code 4). Two other potential North American Parulidae Life Birds I have seen in Central America but not in “North America” as presently defined for ABA purposes: Grey-crowned Yellowthroat (ABA Code 4) and Golden-crowned Warbler (ABA Code 4). I’m hoping for one of them in the next year or two. From Florida Canyon, we drove to Parker, Arizona and found a motel and a nice little Mexican restaurant where we enjoyed a delicious dinner and a glass of beer. We took our time getting started the next morning for the short drive to Planet Ranch Road, a few miles north of Parker, to look for the Nutting’s Flycatcher (ABA Code 5). I had looked for it for a full day a couple of weeks earlier without success. As we inched our way up the very primitive road to mile marker 2, where the Flycatcher has been seen, we met the only other birder on the road, John Battalio from Boise, Idaho. He told us he had just seen the Nutting’s Flycatcher (darn, why had we delayed our morning start??). We joined him walking along the road and soon Barbara spotted the target bird, which proved very cooperative in perching nearby for close-up photos. And so, the trip was a success, with two for two of our target birds sighted and a chance we could get back to Des Moines that day. Here is one of Barbara’s photos of the Nutting’s Flycatcher. As we visited with John, he mentioned that he had come from Phoenix the day before, where he had seen several of the very recently approved addition to the ABA North American Bird List, Rosy-faced Lovebirds (ABA Code 2). He gave us directions to Encanto Park and we decided to drive to Phoenix right away to look for them, and, if successful, to try to get a flight back to Des Moines later in the day. 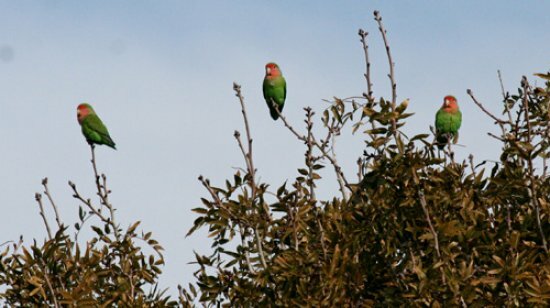 When we drove into the Encanto Park golf course parking lot, the noisy little Rosy-faced Lovebirds appeared by the dozens in the trees around the parking lot. We ended the trip with three for two new life birds, which was a much more exciting result than my prior one for three trip in December. It took a while to rest up from the trip to Papua New Guinea in August, 2012. Much of my birding for the rest of 2012 was confined to my own back yard here in West Des Moines. I participated in the Red Rock Christmas Bird Count in late December. Among the better sightings on that gray, cold, drizzly day were a pheasant, 100 or so Snow Geese, 5 Trumpeter Swans resting on a plowed hillside, 2 Swamp Sparrows and a Northern Shrike. On December 22 I participated very casually in the Des Moines Christmas Bird Count, by noting whatever showed up in my back yard. The only species that was different from what all the other participants were able to identify was a pair of Common Grackles hanging out by my feeders. On Christmas eve my son-in-law spotted some large, white birds flying toward my house from the west. I was able to get the binoculars out in time to identify the 11 Trumpeter Swans that were flying eastward through the mist, like angels going to find the Babe. It was a beautiful sight, and to add to the pleasure, these were the first Trumpeter Swans that I have ever seen from my yard, so they became my Yard Bird number 155. (I have lived here for about 28 years). On December 18th I flew to San Francisco where I rented a car and drove northeast to the Colusa National Wildlife Preserve. 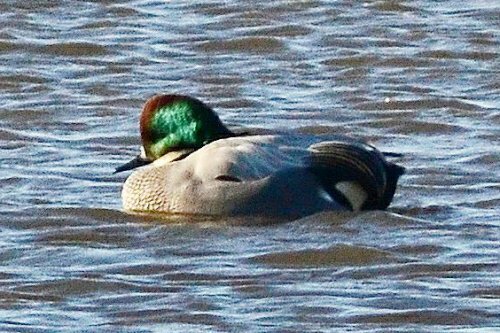 A Falcated Duck, which I have never seen, was being seen there on a regular basis. The afternoon was clear, windy and cold, following upon the heavy rains of the preceding few days. Colusa is a very special place. Thousands of ducks, Snow Geese, other geese and other water birds winter there. Two other birders and I arrived at about the same time and after an hour or so spent scanning the thousands of ducks and geese, hunters’ guns spooked nearly all the geese and I was able to spot the Falcated Duck, actually quite close (my North American Life Bird number 708). One of the other birder’s, Lew Milligan, got a good photograph, and with his permission, I am posting it here. Thanks very much, Lew, and good birding to you. I drove back to San Francisco and flew to Los Angeles where a White Wagtail (which would also be a new North American Life Bird for me), had been seen for several days on the Outer Cabrillo Beach in San Pedro. I arrived early and spent the whole day, but the bird did not show (and has not been seen since). The hours spent lounging on the rocks in the sun while the waves lapped the beach and shoreline rock, was a decent consolation. 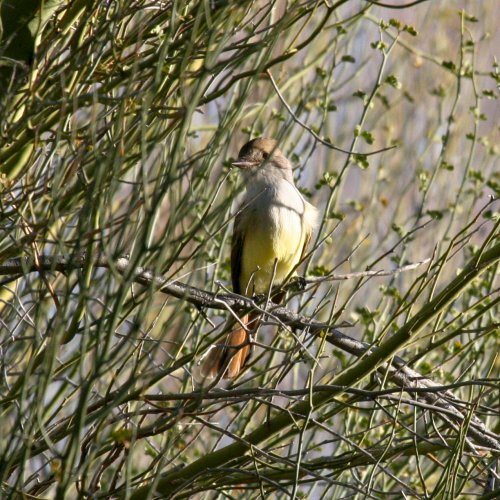 I left in time to catch a flight to Las Vegas and drive to Lake Havasu City, Arizona, where I hoped to find the third of my “life-bird” trip targets, a Nutting’s Flycatcher. One had been reported at mile marker 2 of Planet Ranch Road, south of Lake Havasu City. Planet Ranch Road is posted as “Primitive”, and lives up to its billing. I was able to maneuver my little rental car around the rocks and wash-outs, arriving at Mile Marker 2. The day was a bit chilly and windy, but not too bad. I spent it walking up and down the road, exploring a few trails off road and warming up in the car now and then. The Flycatcher was very reclusive, and I neither heard nor saw it. (It has been seen there again in recent days). Net result of the trip: 1 for 3. My statistics for the year 2012: 91 species of “Yard” birds; 143 species of “Iowa” Birds, 2 new North American Life Birds (Purple Sandpipers in Maine in January and the Falcated Duck in California in December); 4 new Iowa Life Birds (Cinnamon Teal, Arctic Tern, Roseate Spoonbill (believe it or not) and a Townsend’s Solitaire. Lifetime totals to date: North America, 708; Iowa, 332; Yard, 155. I haven’t made a count of the species that I have seen elsewhere in the world, but if I get bored enough in the next few winter months here in Iowa, I will probably try to calculate that. This “empty nest birder” wishes all of you birders around the world (and anyone else who happens to open this blog) a happy and productive year in 2013. Birding is a wonderful hobby, whether you are traveling to the remote corners of the earth or sitting on your own back deck. I am looking forward to adding a few new species to each of my lists in 2013.